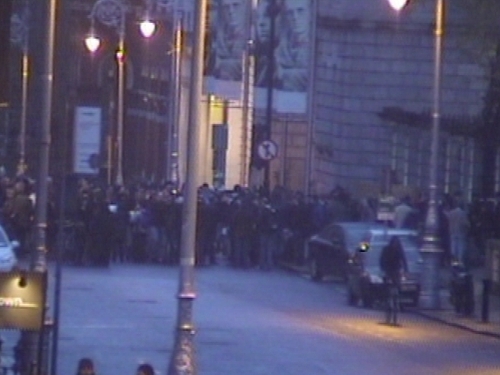 A number of people were injured outside the Dáil tonight after a disturbance broke out at the gates of Leinster House. Gardaí say a group of 500 people were protesting when about 100 of them broke away and tried to force their way into the gates of the Dáil. As the scuffle broke out organisers appealed for calm. Gardaí on duty at the Dáil forced them back - some drew their batons and a number of protestors were injured. Gardaí said one officer received a minor facial injury during the scuffle. The march was organised by the Right to Work Campaign, sponsored by the Unite trade union. The group is believed to have been protesting against the Government plans to inject billions of euros into the country's banks. Several speakers hit out at the Government's handling of the economic crisis. The demonstration began at the Garden of Remembrance.